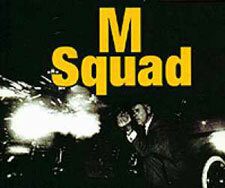 M Squad: Mystery and Suspense on Television. Lee Marvin starred as Lt. Frank Ballinger, a plainclothes detective assigned to an elite police group in M Squad. (M was shorthand for "murder".) The series was set in Chicago with the episodes primarily devoted to fighting organized crime. 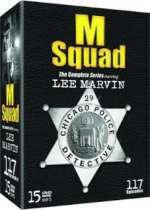 M Squad aired for three seasons on NBC from 1957 through 1960 and was reportedly inspired by the exploits of famed Chicago crime fighter Det. Joseph Morris. Music was an important element of each episode with the muscial arrangements composed by legendary jazz man Benny Carter (and a young John Williams, later the multi-Academy Award winning composer of such movies scores as Star Wars, Indiana Jones, and Harry Potter). For the second season, the great jazz artist Count Basie wrote the series theme music. Individual season DVDs are not available.